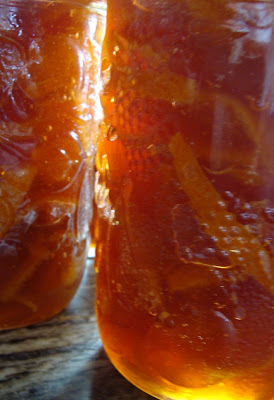 We were given some grapefruit and oranges by a generous neighbour and I'd run out of the marmalade I made in February. Usually I'd wait until I could get Seville oranges, but they might not turn up for several weeks. The combination of a surplus of citrus and a paucity of preserves determined that this should be a marmalade-making morning. I used the same method as in February, but this time with a mixture of grapefruit and oranges. Eating this will be like having sunshine on toast for breakfast: just what we need in the darkest days of the year. where did your neighbour get the fruit from? I don't know why, but your comment worries me. Perhaps it's the anonymity that's the problem. You've got me thinking that you're a police investigator and that perhaps my neighbour is involved in a citrus-smuggling ring with contacts in Florida or Mexico. I believe the fruit was part of a large load purchased at a charity fund-raising event. It was a school fundraiser and the produce was from Florida!